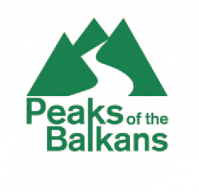 This itinerary involves a hike from Theth (745 m) over the Valbona Pass (1759 m) to Valbonë (995 m). This hike follows the route of an ancient mule track linking the tribal regions of Shala and Nikaj. The trail can be separated into two parts through having an overnight at one of the guesthouses of Rragam (WP 10) approx. 6 km before reaching Valbonё center (WP 3a). Another option for separating the trail is camping at the meadows before reaching Valbona pass. There are no people (neither shepherds during the summer time) near the Valbona pass, but recently a bar is being built and people can be found during the summer time. The hike starts at Theth center, waypoint (WP) 1, and continues northwest on a gravel road with the Theth River on our left. The main bridge of Theth and Prek Harusha guesthouse can be taken as orientation points. After a few hundred meters, we cross a stream along a footbridge and immediately take the path on our right at the junction. The trail takes a right turn at WP 2 and continues northwest. A few meters further on, there are signs for Gusinje, Montenegro and Valbonë, Albania. The hike continues gently up along a dirt road until we see the first house of Gjelaj village along with the mule track on our left at WP 3. We take the mule track and the ascent becomes steeper. After approx. 200 meters, the mule track enters the forest, continuing through it for 1 kilometer until we reach a picturesque meadow (WP 4). This is an inviting place to rest awhile. Our hike next leads steeply uphill northeast, reentering the forest after approx. 500 meters. After walking through the forest for about 1 kilometer, we reach a water source (WP 5). A few meters further on, we pass a new wooden bar which was closed at the time (in Nov 2011), but according to locals will be opened during the summer time for hikers. We follow the path southeast through the forest for approx. 700 meters and then we exit the forest and continue east to the Valbona pass (WP 6). This point offers breathtaking views onto two valleys (Valbonë on the east, Theth on the west). The descent to Valbonë begins northwest and then heads northeast through a series of zigzags (WP 7). At the end of the zigzags, we cross a (dried-up) stream (WP 8). We then continue southwest as the path enters into an open, wooded area along a clear trail. After approx. 600 meters, we reach a stream with drinkable water (WP 9), a good place to rest a bit before taking the final descent to Rragam village (WP 10). At this point, we take a left turn at the junction. In Rragam, our hike is lined by fences and the Valbonë valley can be seen on our right. After a few hundred meters of walking through the village, we take a right turn at the junction (WP 11) and this route leads us down a gravel road lined by pine trees. This is the main road connecting Valbonë with Rragam. We take this route for about 3 kilometers and we finish our hike at Fusha e Gjes Hotel (WP 12). 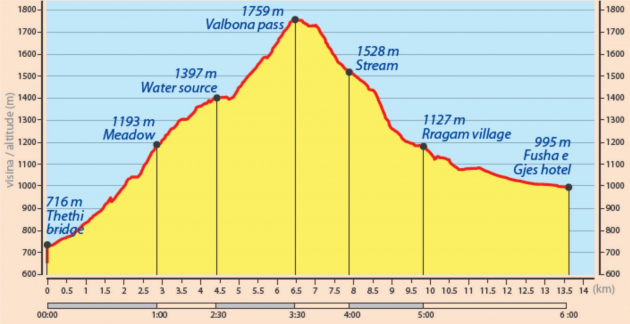 Valbonë center is located 3.5 kilometers northeast and can be reached by taking this route.